Meg ran at the Olympic Trials in Houston. Here's the news! I can't say that I train for any particular race. I just go out everyday and run, never a set distance or pace, just whatever my body feels like doing. "Losers make excuses, winners make it happen." I run because it is relaxing and a time for me to be by myself and not think about anything. I also run to stay healthy. 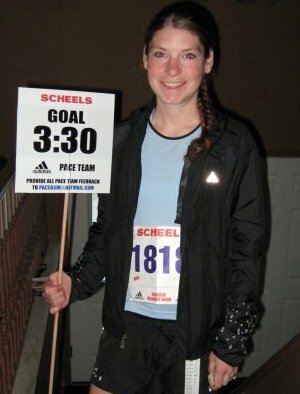 2006 Fargo Marathon. This was the second marathon I had run in my life. I was quite unprepared, and just went out to have fun. My family was cheering on several street corners, so it was fun to see them throughout the race. Around mile 22, the lead bike started riding in front of me. I couldn't really believe I was the first female and figured there was another female close behind. I just kept on running, and ended up being the first female and beating my previous time by over 27 minutes. Being from Fargo made the win that much more exciting. I pace because I love running and I love helping people push through the tough miles to reach their goals. It is very rewarding. All of my pacing experiences have been fantastic! The group I had in Stillwater really stands out, though. It was a group of mostly women who were extremely energetic, fun to talk with and strong runners. The course was very scenic and had some challenging hills, but overall, it was put together very well for a first time marathon. People should join my group if they would like to reach their goal time. I run pretty consistent splits, I enjoy telling and hearing stories, good jokes, whatever you can do to pass the time. I am tone deaf, so I will not be singing for the group, but do welcome others to sing. I do not walk through water stops. Make sure to bring GU or some type of nourishment to aid you throughout the marathon. I take GU at mile 13 and 19, but most people require more. Practice eating GU or whatever you plan to eat on marathon day during your training runs, so you will know how your body will react. Do not over train. If you have run 16-18 miles, you will more than likely be able to do a marathon. Running to many high mileage training runs tends to overwork your body and break it down prior to the marathon. I am a vegetarian. I think eliminating meat and fish has actually helped me in running. I love to chat about nutrition, so come ready with questions. I enjoy bike riding and being active as much as possible. Running is my real passion. I have a black Persian cat with bright yellow/orange eyes named, Herbie. I have been married for 4 years and currently live in Moorhead, MN.